With an area of 600 m 2 built on the concept of "Ideas for living", this center demonstrates all oustanding home soultions, especially, presents "Black range" a new collection of premium home appliances which is a combination of innovative technology solutions and unique design in black. Customers can explore a dream kitchen in real with a wide range of steam oven, built-in oven combined microwave, induction hobs, hoods, refrigerator and coffee machine. Notably, these products are regconized by their environmental friendly and effective touch screen features. With regard to Häfele storage solutions, all the space saving ideas you need are hidden behind a cabinet door. Everything is neatly stored in its own area and easily accessible while saving space. You can easily find the smart storage systems and diversified accessories with an extensive range of trays, hampers and racks that fit effortlessly in the system and flexibly adapt to different wardrobe interior sizes which all help to create a wardrobe that is both clever and tasteful, making the well-known problems of traditional wardrobes with clothes rails and shelf compartments a thing of the past. Besides, customers can also find a variety of architectural hardware and bathroom accessories. 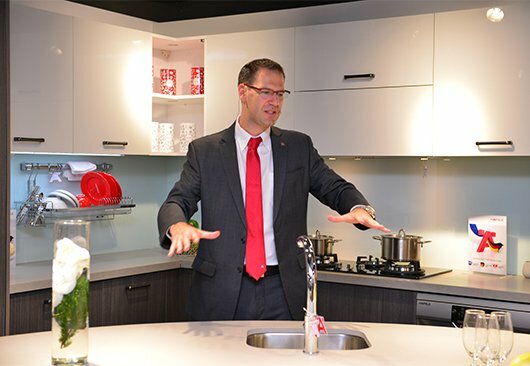 Particularly, not only can Häfele offer laminates to finish off furniture with latest design trends from Europe, but with its new service of pressing, cutting and edging laminates to cabinet and kitchen fronts, customers can enjoy the one-stop-solution-service provided by Häfele. 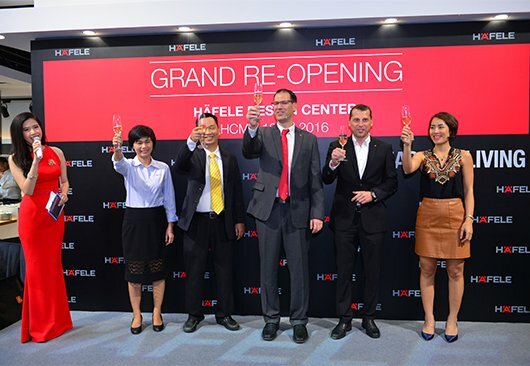 European designs combined with the best edging quality throughout Vietnam make this new service a value-add when choosing Häfele. Promisingly, the return with new appearance, this is where customers, designers and architects can get new creative ideas for their houses or buildings. 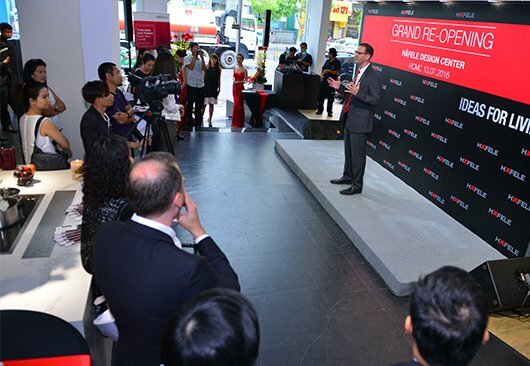 On this special occasion, Häfele Vietnam promotes a numer of attractive offers applied at nationwide showrooms until 31 August 2016. Please update more on our promotion. Picture: Well-known Chief David Thai perfomances live cooking with "Black range"